The momentum is reaching fever pitch as my life drawing group, The Bunya Artists, as we prepare for an exhibition of our work. We are joining the annual Samford Art Trail for four consecutive weekends in June. Twenty one artists and groups of artists from Brisbane’s foothills will open their studio doors to the general public. Some are also running workshops. For many in our group, me included, it will be the first time they’ve plucked up the courage to put their drawings on public display. It’s daunting, but also exciting. We’re a mixed bunch, male and female, young and old. Some of us have been drawing for many years while others are relative newcomers. What brings us together is the ever changing human form and a common desire to master observation, translation and interpretation on paper. If you live in the Brisbane area, the Samford and Surrounds Art Trail and Open Studios will be a month of artistic exploration not to be missed. The link will take you to the online map and description of the artists involved. Thankfully my outcomes as a cook and recipe developer are far more predictable than they are as an artist. It could be simply practice, but anyway, I’m putting together a box of goodies for our group to snack on while we man the exhibition. I grabbed this chance to use up some white chocolate that has been hanging around in my pantry. It’s the only “chocolate” that I don’t have to hide away. It’s white chocolate that brought me to the recipe on which these Sour Cherry, Almond and White Chocolate Bars are based. Inspired by the cranberry, oat and white chocolate biscuits from “Sweet” by Yotam Ottolenghi and Helen Goh, I’ve eliminated the wheat from the original recipe and changed the method a little for ease of handling. These delicious treats were difficult to photograph but very, very easy to eat. Line 2 X baking sheets with silicone paper. Spread the almonds onto one of the baking trays then roast them for 10mins. Set aside to cool, then roughly chop. Put the flours, salt and oats in a bowl, whisk to combine then stir through the almonds. Cream the butter, sugar and zest until light and fluffy. Stir through the flour mix. Add the soaked cherries with the juice and stir until just distributed. Lightly dust the bench with rice flour then pat the dough into an oblong and divide into four equal pieces. Dust the surface of the dough then roll into strips approx 32cm X 9 cm and .5cm thick. Cut each strip into fingers approx 2 cm wide. Use a spatula to transfer the fingers of dough onto the baking tray. Allow a little space for the fingers to spread. Bake until golden and firm to the touch, about 18 minutes. Transfer to a cooling wire until completely cold. Melt the white chocolate over a gentle heat. Spread a generous dob of white chocolate on top of each finger. Allow the chocolate to set hard before storing in an airtight container. Beautiful. I love almonds and sour cherries together! So cool! And the sweets look good too. All the best for the exhibition Sandra… wish that I could come take a look as well! This sounds like a delicious treat to have made to share with your fellow artists. Sour cherries (like cranberries) go so well with white chocolate and nuts – yum! These look and sounds tops, will substitute the gf oats for something else. How wonderful that you are exhibiting, if I lived there I would come look see for sure. I’m sure you’ll come up with a grand GF version. You’d be welcome.. I wondered about the scare mongering of brown rice and arsenic, though there is a suggestion that infants should not consume brown rice milk and the evidence for products based on brown rice ( not soaked and cooked) products such( rice flour, rice milk, rice syrup) seems worth a little caution. Yes, I don’t eat truck loads of rice. Sounds fabulous, and I would suggest that your art, while never predictable, is just as beautiful as your cooking. I like your substitutions but am wary of brown rice products these days. I guess any other flour might work well here. Fran, why! As you may have gathered I am at three unis at the moment studying this amongst a plethora of other nutritional/health matters . . .so I presume arsenic ? Unproven and you would have to eat a truckload for this to have any effect !! The positives so outweigh the negatives I only keep minimal amounts of white for some fave risotto recipes . . .
Brown rice flour is an enormously useful ingredient when following a wheat free diet, it takes weeks to use 250g so I’m not concerned. Yes any flour will work, I deliberately modified the recipe to suit a special request. I can always tell that it’s a Lady Red Specs recipe before even before I check the gravatar. Lovely recipe Sandra. Would it be too terrible of me if I used real chocolate? These sound luscious, but for me, I’d substitute dark chocolate as I find the white stuff too sweet. Now that is what I call a sweet dessert and has my weakness for sour cherries. As always Sandra…Yum Yum! 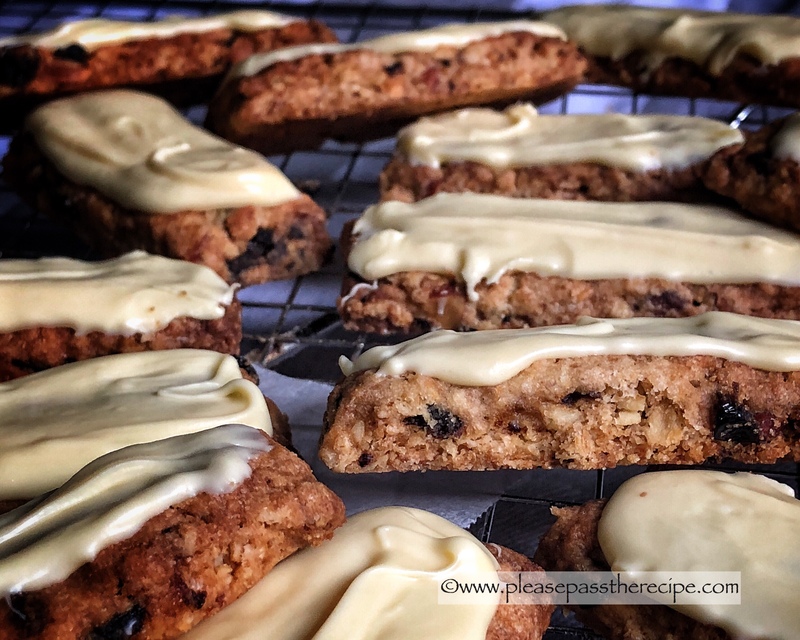 This entry was posted on May 31, 2018 by ladyredspecs in Baking, Cookies, sweet biscuits, Cooking, Food, recipes, Sweet mouthfuls and tagged afternoon tea, almonds, artists, Baking, biscuits, Brisbane artists, cookies, exhibition, life drawing, Samford Art Trail, sour cherries, sweet treats, white chocolate.